Wally Backman is joining the Mets on Friday in Atlanta as a coach. 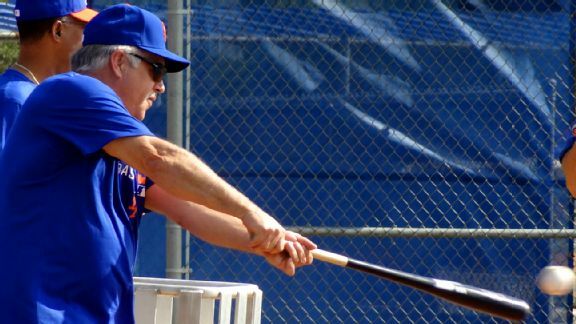 He may remain on the staff in 2015.NEW YORK -- Fans may view Wally Backman as their preferred successor to Terry Collins as Mets manager. Instead, Backman could end up on Collins’ staff to open next season. Regardless, Collins views Backman as an ally, not a threat. Backman joins the Mets on Friday in Atlanta as an extra coach for the final nine games of the season. The Mets annually bring one minor-league coach to the majors in September as an extra staffer. Last year, Double-A Binghamton manager Pedro Lopez received that honor. Two years ago, Backman received the call-up after managing Triple-A Buffalo. This year, Backman’s Las Vegas 51s finished with an 81-63 record and won their division before being bounced in the first round of the playoffs. The same thing that attracts fans to the fiery Backman endears players to him as well. Erik Goeddel said the ball was definitely fair. “It wasn’t even close,” the reliever said.